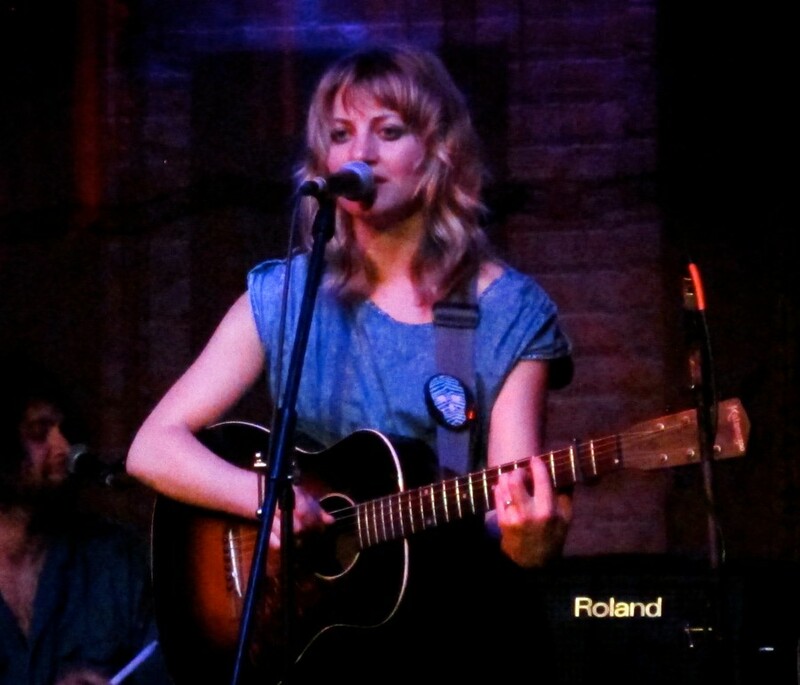 The Maroon spoke with folk songwriter Anais Mitchell. Anaïs Mitchell played an intimate set to a full house at the S.P.A.C.E. Theater in Evanston last Saturday night. The native Vermonter took the stage in a black miniskirt, tights, and lace-up boots—but it was her lyrics and personality that shined most, not her chic style. The singer-songwriter, who released her first album, The Song They Sang…When Rome Fell, in 2002, has released four more albums and an EP since her debut. She released the album Young Man in America in February on her own label, Wilderland Records, after having released her three previous recordings on Ani DiFranco’s Righteous Babe Records. Young Man in America is Mitchell’s first album since 2010’s Hadestown, a folk opera based on the Ancient Greek myth of Orpheus and Eurydice. With her recent standout endeavors, the folk singer-songwriter has been steadily gaining recognition in the United States and internationally. Before the show at S.P.A.C.E., the Maroon had the chance to chat with Mitchell, discussing Young Man in America, the progression of her career, and her musical relationship with Bon Iver. Chicago Maroon: What has your touring schedule been like since the release of Young Man in America? Anaïs Mitchell: It’s been great! The record came out at the end of February and it’s been a busy spring, mostly rolling around with my little band, The Young Man Band. There’s four of us all together, including my husband, my friend Rachel Ries (who’s also a songwriter, we made a record together at one point), and our friend Ben Davis. Right now we’re on tour with Ben’s other band, Cuddle Magic, who opens the show, and then a bunch of its members sit in with us for our set. We did the East Coast and California, and then this Midwest run is our last set of performances in the states for this tour. Then we’re going over to Germany and England. CM: Has anything changed from previous tours? AM: Having a band is definitely a new thing for me. I’ve often toured solo or toured with one accompanist but this is really like rolling around the country in a van with my friends, so that’s quite different. I’m most excited right now about the songs that we’re really fleshing out with different instruments. CM: Are you excited for the concerts abroad? AM: Totally. I love playing in England especially. Something about that audience and how they listen to music connects with the kind of songs I write, which are very narrative and lyric-oriented. CM: With the release of Young Man in America, it seems like more people than ever are really responding to your music. Can you explain the progression of your career? AM: It’s been very steady, and slow! It feels very organic; each record reaches a few more people. My first record came out on a little collector’s record label in Chicago called Waterbug Records. Then my next album came out with Righteous Babe, Ani DiFranco’s label, and it was great to be on that label for three records and to get to tour with Ani. I felt like I was in the “ocean” of independent artists; it was really nice to have a little raft to ride on and be a part of that family. Then I recorded the opera Hadestown. It has many different beautiful guest singers, some with a lot of fans, singing the roles of the characters. Getting to meet Justin [Vernon, of Bon Iver], touring with him, and working with him on that record was another step forward. And then Young Man in America we actually put out ourselves—started the record label, made a rubber stamp with the record label logo on it, and that’s been really cool. It seemed like the right time to do that. CM: Bon Iver has been performing one of your songs, “Coming Down,” on their recent tour, and Justin Vernon sang the part of Orpheus in Hadestown. How did all of this happen and do you like the cover they’ve been performing? AM: Oh my god, I love it! When I heard it I was like, “I never want to sing this song again.” It was so beautiful and such an honor. The way I first met those guys was pretty rare. They had put out their first record, and they just reached out to see if I wanted to open up a tour for them in Europe. We hadn’t met before; they had just gotten a hold of one of my early records and were into the songs. It was a tremendous and random act of kindness from the universe. So when I heard him sing I thought, “This guy has to be Orpheus,” and Justin said he would do it. I feel really lucky to have gotten to know Bon Iver and witness them take off after the release of For Emma, Forever Ago. CM: You mentioned your association with Ani DiFranco. Can you talk a little more about that? AM: I came of musical age listening to her music, and I don’t know if I would have picked up a guitar if it weren’t for her. She performed “to us” and “for us” in such a direct way. She really opened the door for a new kind of expressiveness in women, as well as in songwriting in general. When I heard her music, I thought, “This is what I want to do.” I was playing a show in Buffalo and the promoter happened to be her childhood guitar teacher. He invited her out and she came with others from her label. When I was signed to her label, I thought, “How is this happening?” I think she’s a woman of integrity and also really kind, sweet, and smart. CM: The Philadelphia Inquirer and other publications have said that Hadestown evoked Brecht/Weills. Your new album, Young Man in America, is also quite serious. Do you always gravitate towards darker compositions? AM: It’s funny, a lot of my songs end up being very sad or have this darkness to them that isn’t part of my life; I am a pretty happy person! I don’t know if I’m attracted to tragic stories and themes because it’s kind of a way of exorcising those things from my life, or if it’s like a vitamin supplement that provides what I am not getting in my life—tragedy! I love to cry, I like to be moved by music and by movies, and I like the extremes of emotion that you can feel just vicariously through art. When I feel like writing, like pursuing an idea, it is because there is something uncomfortable about it, a hole that I want to explore, a dark cave. I used to set out to write a song with almost a plan, like I would think, “I would like to write a song about a certain subject.” Nowadays, I’m so fascinated by the process and feeling your way poetically and putting one foot in front of the other. I just really like to get in there and see where it goes. CM: Why did you write the song “Young Man in America”? AM: Well, the first stanza came out of nowhere. I was driving in my car on Interstate 95 on the East Coast and that stanza came—“My mother gave a mighty shout / Opened her legs and let me out / Hungry as a prairie dog / Young man in America.” It was like a birth announcement—the young man had announced himself. It was inspired by feelings in my own life, people I knew and people I was close to. It reflects a feeling about this country and some of the stuff we’re facing: a feeling of abandonment, not knowing if we’re going to be taken care of by the government, by the economy, by the community. The character became kind of an avatar, expressing things I wanted to say but wouldn’t be able to if I were the speaker in the song. CM: Was the song partly inspired by some of your own feelings? Are you a “young man in America,” or are you just describing one? AM: Yeah, I think there’s a little “young man” in all of us. Being able to dress up in those clothes [as a male character] made me feel freer to express feelings that, if it were me, Anaïs Mitchell, expressing, maybe I would feel silly, or the songs would feel more confessional and less like stories in their own way. I also listened to a lot of British folk music during the making of this record, and I know that a lot of that language found its way into the songs. This idea in “Young Man in America” of a black and roving eye is thousands of years old, but we still know what it means today and get a really visceral feeling from that. So it felt cool to be able to fold some of those old images into these songs and make them more contemporary. CM: I’ve read that you grew up reading Anaïs Nin? AM: Yeah, I am named after her. I probably came to her books younger than I would have otherwise, because I was so curious: “Who is this woman I am named after?” I didn’t read a lot of the novels, but I read the diaries and her erotica too. And Henry Miller, I got really into him. I read Tropic of Cancer and Tropic of Capricorn; there’s nothing like it. He’s brilliant. CM: What was your experience growing up in rural Vermont and how has it influenced your music? AM: My parents were full-on hippies. They were part of this “back-to-the-land movement.” They were transplants to Vermont; they both grew up elsewhere and bought this farm in the late ’70s. It’s pretty rural: We didn’t have TV; the neighbors were a couple miles away. In Vermont, you have to be comfortable with isolation and make your own fun! My brother and I spent a lot of time running around in the woods making up games and stuff, and it was a very imaginative place to grow up. But my dad ended up teaching at Middlebury College, which was not far away, so there was always this access to traveling professors and artists. I definitely felt a sense of freedom. I feel lucky that the idea that I could make a life in songwriting was encouraged.